For those of you who may not think of this as a classic Rock LP – I disagree, the spirit of Rock goes far deeper than volume and virtuosity. And as a historic LP, there is no question. Donovan certainly started out labeled as a Folk Rock Balladeer, and in the early “Catch The Wind” days he was being touted as the British Invasion’s answer to Bob Dylan; neither turned out to be true as Donovan carved-out his own niche in the Psychedelic Rock genre and many rightly claim the July 1966 “Sunshine Superman” single as the first true psychedelic song. This LP became a serious favorite of mine and many like-minded Hippies and upon repeated listenings I really got into the mood of each song. So I seriously love every cut, however for the historic aspect I’ll list the three absolute solid classic Donovan and classic Psychedelic Hippie-era songs off this LP plus my personal favorite. 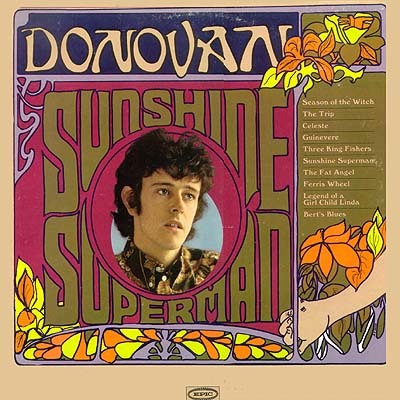 “Sunshine Superman” for me at fifteen, will always trigger the incredible highs of the time spent with a fourteen year old Swedish girl I met at the beach and then hung out with that summer and for the rest of the year – Donovan’s single was hot and so was she. “The Trip” is a song that had a funky stone groove and celebrated my stompin’ grounds; the Sunset Strip and specifically the club “the Trip”. Donovan gave it a hip and cool jazzy take that still had a psychedelic atmosphere about it. “Season of the Witch” – now this track is just a flat out psychedelic, blues/rock classic and then some – perfect for any stoned-out evening and at four minutes and fifty six seconds it was considered a decently long song. Donovan was just about a minute shy of matching the first hit single to break the six minute barrier; Bob Dylan’s “Like a Rolling Stone”. “Celeste”, well, this is not only my favorite track of this LP but an all-around favorite single; truly sublime. This track literally touches me deeply, and not in a sappy way, no, more like what it would have been to live another life, in another time, but really feeling it in your heart, a kind of pain. There are many songs that come close to this level of sound and music appreciation by my soul but for whatever reason, this song by Donovan hit all the elements to create something way more than a song; it is a portal to a place that is known, remembered and a place that makes you feel homesick, yet joyous. To achieve that, Donovan rates extremely high in my “Book of Rock Greats” as he is uniquely unique; no one could capture his voice, turn of a phrase or the songs he chose to record. Furthermore, his classic “Wear Your Love Like Heaven” is drenched in the real deal – very, very psychedelic, it gives me acid flashes, I mean the Pavlovian kind, not the TV/movie kind, I can feel myself coming on and I begin to salivate a little just like when you feel the first surges of LSD in your system, but this is a good thing – and why? Because its the catalyst for memories of fantastic times never to be seen or experienced in history again! Donovan has recently linked up with an idol of mine, David Lynch, in creating awareness for Transcendental Meditation to the point of trying to get it taught in schools; which would be great as TM is non-religious and since they don’t have physical education anymore then at least let the kids get some exercise and run around inside their own selves. The Bottom Line: this is easily a historic and great psychedelic rock album and more importantly represents the appreciation and acknowledgement that all us Hippies and Rockers had for any music that was good. Plus, Donovan was just too important of a consistent figure and influential icon of the psychedelic ‘60s rock era that it would be a personal crime not to include him. And while not from this album I can’t resist; “Hurdy Gurdy Man” and “Barabajagal” both with Jeff Beck! I was fortunate to get tickets to see Donovan live 11-29-2005 at the Wilshire Ebell Theatre, L.A.; it was a groovy, trippy fully enjoyable concert! This LP was released over forty-six years ago, that’s pushing half a century! And it is still fresh, new and amazing! Timeless!